SILVER SPRING, MD — With support from 20 organizations and 265 individuals, the 15th annual .org Community Food Drive raised $25,162 for the Capital Area Food Bank. The food drive is sponsored by Silver Spring-based technology consulting firm DelCor Technology Solutions. The company enlists others—associations, vendors, and individuals throughout the community—to join and support the drive. In 15 years, more than 100 organizations and thousands of individuals have participated. The Capital Area Food Bank serves more than half a million people throughout Metropolitan Washington, including the District of Columbia; Prince George’s and Montgomery counties in Maryland; as well as Alexandria city and Prince William, Arlington, and Fairfax counties in Virginia. Sixteen percent of the region’s population—700,000 people—are at risk of hunger. DelCor has deep ties to the region. The company’s founder and CEO, Loretta Monterastelli DeLuca, is a Silver Spring native and the company is incorporated in Montgomery County, just outside of the nation’s capital. DelCor provides technology strategic consulting, hosting, and managed services for mission-driven organizations, particularly associations—organizations that themselves are mission-driven. And Metropolitan Washington is home to the largest concentration of associations in the country. This alignment of values brings those organizations together, along with vendors in the association space, to solve hunger in our community. In the 15-year history of the event, DelCor has experimented with formats, platforms, messaging, and volunteerism to engage new and veteran donors—they were the first to host a virtual food drive for CAFB in 2011. The food drive has been all-virtual since 2013, empowering donors to more than double their impact. Added up, the .org Community Food Drive has provided 451,000 meals in 15 years, included more than 100 organizations, and energized thousands of donors. Some have been inspired to hold their own food drives, volunteer, or otherwise engage with CAFB. This year, donors who wanted a hands-on experience were encouraged to volunteer for the food bank’s weekend Community Marketplaces in NoMa, D.C.; Landover, Maryland; and Reston, Virginia. 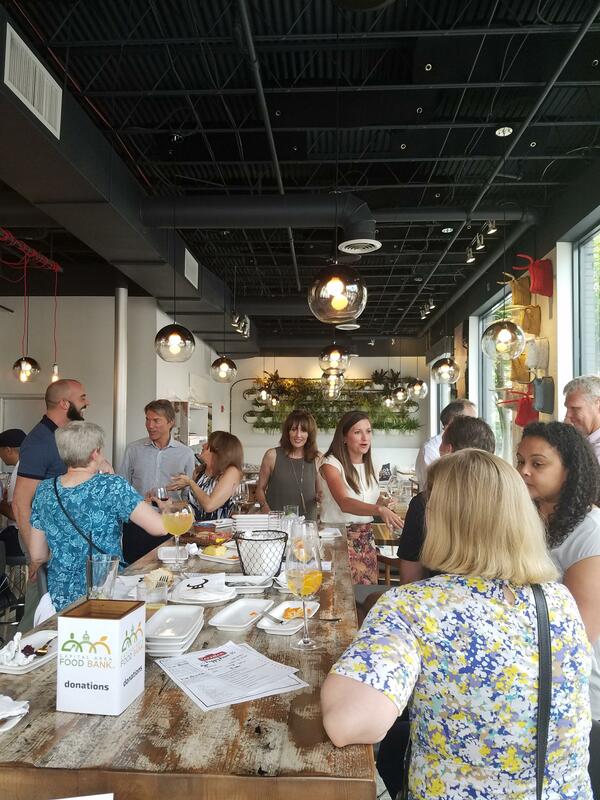 The company, donors, and food bank staff marked the anniversary with a happy hour hosted by TapaBar in Bethesda, Maryland, which donated a percentage of proceeds to the cause. DelCor Technology Solutions, Inc., is an award-winning, independent technology consulting firm headquartered in Silver Spring, Maryland. Authors of the IT Maturity Model for Associations & Nonprofits and informed by 200 years of experience as association executives themselves, DelCorians are driven to help organizations fulfill their missions, visions, and business goals. Since its founding in 1984, DelCor has helped hundreds of organizations around the nation and world achieve progress through technology strategic consulting, hosting, and managed services. The Capital Area Food Bank is the largest organization in the Washington metro area working to solve hunger and its companion problems: chronic undernutrition, heart disease, and obesity. By partnering with nearly 450 community organizations in DC, Maryland, and Virginia, as well as delivering food directly into hard-to-reach areas, the CAFB is helping 540,000 people each year get access to good, healthy food. That’s 12 percent of our region’s mothers, fathers, sons, daughters, sisters, brothers, and grandparents. To learn more, visit: capitalareafoodbank.org, or find the Capital Area Food Bank on Facebook at facebook.com/CapitalAreaFoodBank, and Twitter at @foodbankmetrodc.